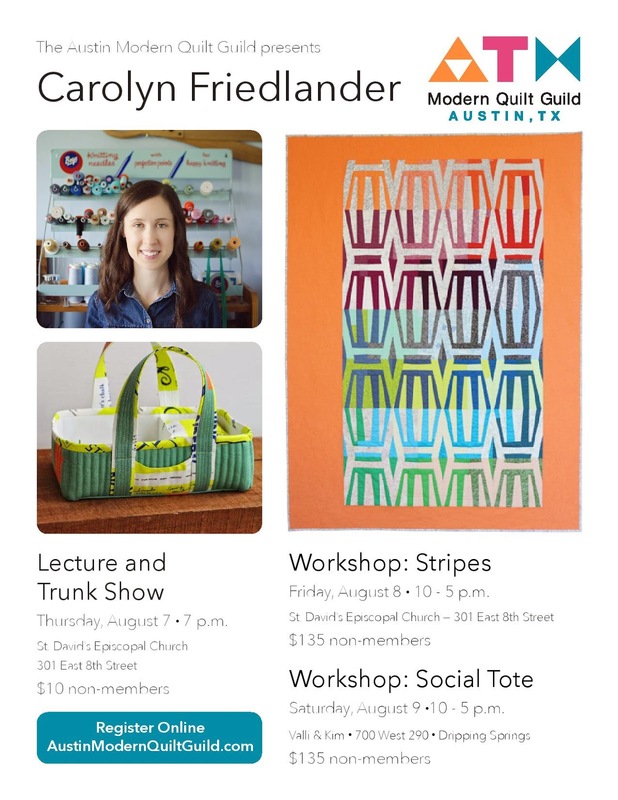 Austin Modern Quilt Guild: Carolyn Friedlander is coming to town! Carolyn Friedlander is coming to town! This is the week everyone. Carolyn Friedlander is coming to town this Thursday 8/7 for a Lecture and Trunk Show and spending the weekend with us for two workshops! Friday she's teaching her awesome Stripes paper piecing quilt and Saturday it's Social Tote time. If you're planning on coming to the trunk show Thursday night, click here to RSVP. There are still two spots left in each workshop, so if you have been on the fence about signing up, now's the time. Click here to sign up.